Azimjon Askarov is a journalist and member of Kyrgyzstan’s Uzbek minority who has spent his career exposing corruption. He was arrested during the inter-ethnic conflict that swept Osh and Jalal-Abad in June 2010 and convicted, on 15 September 2010, of organising mass disorder and complicity in the murder of a police officer; he was sentenced to life imprisonment. 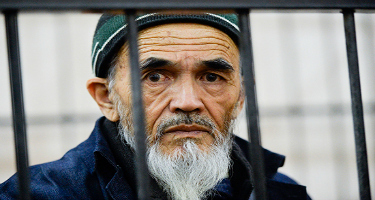 The UN’s Committee on the Elimination of Racial Discrimination and other independent observers have declared that Askarov did not receive a fair trial. An official investigation commissioned by the government’s own human rights ombudsman concluded that Askarov was not even at the scene prior to the police officer’s murder and, therefore, that he had played no role in the killing. PEN believes that Askarov was targeted solely for his critical reporting of police corruption and that he should be released immediately and unconditionally. Askarov, 61, has not always been a journalist. A practical, creative man, he studied art at university and, for the first 15 years of his adult life, worked as a house painter and decorator. He only turned to journalism in the mid-90s, contributing to the regional news websites Golos Svobody (Voice of Freedom) and the Ferghana News Agency. He quickly made himself unpopular with the authorities by exposing local corruption; his investigations into police involvement in criminal activity reportedly led to ten police officers losing their jobs. Askarov maintains that he took no part in the clashes of 2010, and that he spent most of his time documenting it; he took photographs of victims (both Kyrgyz and Uzbek), made extensive notes and went to the local morgue to identify bodies. He also wrote that he witnessed Kyrgyz police officers shooting ethnic Uzbeks. The evidence against Askarov is widely considered by human rights NGOs to be fabricated. Since his arrest, Askarov has repeatedly complained of being beaten and threatened, including during his trial; these claims are supported by independent witnesses. An examination carried out in January 2012 by the international NGO Physicians for Human Rights (PHR) concluded not only that Askarov’s health had deteriorated, but that he showed clinical evidence of traumatic brain injury consistent with his claims of being tortured. In November 2012, the journalist’s lawyer submitted a complaint to the UN Human Rights Committee. · Call for anyone found responsible for violating Askarov’s rights to be brought to justice and for Askarov to be provided with adequate redress for any such violations, including an enforceable right to compensation for any torture he is found to have been subjected to.